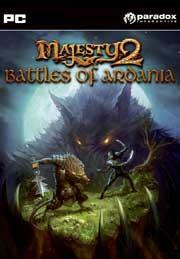 Battles of Ardania is the second expansion pack available for Majesty 2. It offers eight new single-player campaigns, with more than half of them on the hardest difficulty level. In Battles of Ardania, there\'s only one novice mission and a couple of advanced ones. The Kingmaker expansion had goblins wielding jack-o-lanterns as your enemies, whereas this expansion offers new foes: half-werewolf/half-snake creatures. It\'s time to defend Ardania once again! When you start a mission, you have some money, your castle, a guard, as well as a tax collector and some peasants. The peasants will pay taxes and build the buildings for you. You can build guard towers that will come with a guard to help defend against nearby monsters, skeletons, and big sewer rats. Most of your defenses however, will be from guilds. The guilds include rogues, rangers, warriors, clerics, mages, dwarves, and elves. Each guild has to be upgraded a couple of times to offer better attacks and spells. With each guild, you can research a power to aid your heroes. The mage\'s guild offers a few of spells that you can use to zap single or multiple enemies (for a price, of course!). I especially liked the dwarven ability to reinforce structures to speed up the building or repairing process. After your castle has been upgraded a couple of times, you can construct various temples in designated areas (holy ground). The temples provide several priests and priestesses, as well as powerful abilities such as resurrection or the ability to send a plague. If you don\'t have the ability to resurrect, the first time a hero dies, a cemetery will be constructed through which they can be resurrected. A fee is charged, though, which increases depending on the hero\'s level. There is a built-in store interface where you can purchase new missions, spells and abilities for your units. Some of these items are also free to download. The items you purchase are only available if your system is online. If you like modding, there\'s a map editor available. The single player missions are all the same and mostly consist of defending the castle for a given amount of time. There\'s also a challenging mission that pokes fun at Robin Hood. Graphically, Battles of Ardania is very appealing. The maps are very detailed and the 3D characters and buildings look great. Visually, there are no unique features to a unit; however, heroes vary with their levels and upgrades they purchase. The spells look pretty neat and the physics are spot on. Monsters look quite scary and their animations are fitting. I was very impressed with the background music in this game; it\'s very pretty and reminded me of Lord Of The Rings. The voice acting is decent, and the adviser still sounds like Sean Connery. The campaign missions were nicely narrated, but the single player intros are text only. I\'m not sure why they didn\'t narrate those as well, and it seems strange. Another nitpick is that the elf voice is a little odd - it sounds like a child. Majesty 2: Battles of Ardania has fantasy violence, but it\'s not really bloody or gory. You will be battling with demons, as well as eliminating portals to hell, so there are some dark themes. I was glad to see no real occult symbols used. Magic is used and cannot be avoided. There is mention of alcohol and some pub buildings. I also heard "d––n" once in a mission briefing. Lastly, elves and dwarves hate each other so there\'s mild fantasy racism. Majesty 2: Battles of Ardania is a nice expansion, and at $15, it\'s hard not to recommend, especially if you like a challenge. As an aside, I never had enough gold, so I wound up using Cheat Engine to modify the memory addresses that contained my gold values (in single-player only). If you enjoyed Majesty 2, pick up the expansion: There aren\'t many problems, and it\'s overall a very solid offering. It\'s a shame that there is no one to play against online.